Game 2: 1.3K Blood Angels 2v2 Tau | 30mm Madness! 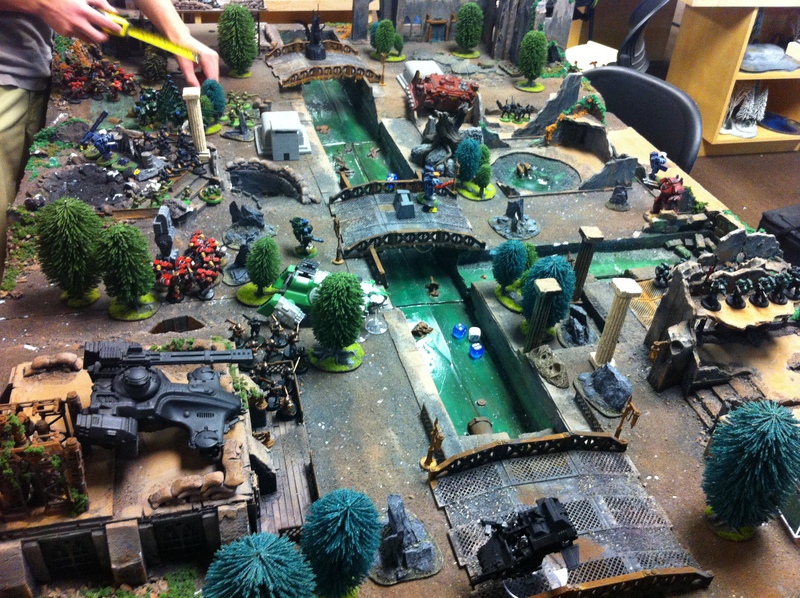 It was a team game… my ally was Joe, playing Dark Angels. My opponents were Ryan and Jim, both fielding what ended up to be very mean and shooty Tau. While me and my fellow space marine lost in actual ‘victory points’ I learned a LOT and had great fun. The 3 man squad of Tau XV-88 broadsides with with shield drones and rail guns HURT. Between the other shooty units doing some damage and the 6 railgun hits (AP1/2) my assault squad wasn’t able to close into assault after deep striking in. I’m not sure how to counter this and need to think this through. I need to bring a regular tape measure…the fabric one I have isn’t great for 40k. I need to write my name on all my stuff…when theres 12 players all with rulebooks and gear out, it can get a bit confusing. Dreadnoughts are slow and while tough, haven’t been relevant until late game when the tide is already not in my favor. I need to either drop-pod them in and hope they survive an enemy round of shooting… and/or order the lucius pattern drop pod from Forgeworld. The contemptor patter dreadnoughts 5+ shooty invulnerable saved ended up being worth it! When I WAS able to charge into assault with my assault marines…the Tau dropped like flies. I still need to study assault rules & vehicle rules. I have movement and shooting phases more or less down (although I still have to ask for opponents toughness and think for 5-10 seconds on to wound roles in the shooting phase. This entry was posted on June 1, 2012 by justinhardin. It was filed under Battle Reports, Blood Angels, Warhammer 40K .